Furthermore, the park continuously adds rides and slides every year to keep everybody happy and coming back for more. Our family makes it to Noahs Ark Water Park Wisconsin Dells at least once every summer, and it is still a blast every time we go. 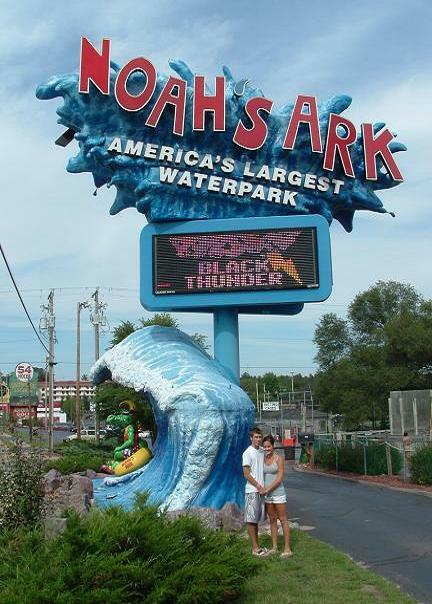 Tip #1-Check out the Noahs Ark Water Park Wisconsin Dells website for discounts, coupons, and vacation packages. They have a package set up with the Flamingo Motel, so look into that if you plan to stay in the Dells. Tip #3-Remember to bring sunscreen, and more specifically, waterproof sunscreen. You’ll be in the water more often than not so waterproof is the way to go. Tip #4-Use the waterslides early in the day and late in the afternoon. The peak time for waterslide usage is between noon and 2 pm, so if you don’t like long lines, don’t use them during this time. Instead, try the mini-golf or lazy river. We arrived at Noahs Ark Water Park Wisconsin Dells about a half hour early (park opens at 9 am), and got in right when it opened. Right away, we wanted to take advantage of the most popular waterslides before they got real busy. We found some lounge chairs next to the Big Kahuna Wave Pool and immediately went to the Stingray, Point of No Return, Black Anaconda, and Time Warp in that order. Virtually no to short waits, and we rode each a couple of times. I’m pretty sure that the Point of No Return was our favorite ride. From there, we went to the far end of the Noahs Ark Water Park Wisconsin Dells and rode Congo Bongo, Black Thunder, and Dark Voyage. Once again, short waits and we rode them a couple of times each. By the time we were done riding these slides, the park was getting a little crowded. So we could now take a much needed break and relax in our lounge chairs, try the Adventure River (Lazy River), and play some mini-golf. After mini-golf, we had a snack and headed to Noah’s Incredible Adventure. This place was incredible. When we arrived, we had no idea what was going on or what to expect. They call it a topsy-turvy, wild ride of discovery, and that’s exactly what it is. It is also a dry ride, another nice break from the water and sun. After that adventure, we decided to try some of the other waterslides such as the Plunge, Kowabunga, Jungle Rapids, and Flash Flood while others in the park where using the more popular ones. It worked out perfectly for us, short lines and great fun. By this time, we were getting tired. We went back to our chairs, hit up the Big Kahuna, and called it a day around 4 pm. The newest ride that Noahs Ark Water Park Wisconsin Dells has to offer is the world’s largest bowl ride, Time Warp. It is new for the summer of 2006, and we’ve had the pleasure of already experiencing it. It is really nice for families or groups of friends, as four people can go down in one raft at one time. “Time Warp” is an enclosed ride and riders feel the effects of total drops of 70 feet and speeds of 30 mph. It’s unlike any other ride I have ever seen, and it is sure to have you and your friends/family holding on tight. *Noahs Ark Water Park Wisconsin Dells uses five-million gallons of water to fill all pools. *It costs $1500 per day to make the waves for the Big Kahuna. *Riders go 40 mph on the Point of No Return. *The Adventure and Endless Rivers combined total almost a mile in length. *The ride Dark Voyage pumps 8,000 gallons of water every minute. Noahs Ark Water Park Wisconsin Dells is open daily from late May through September 1. Hours are subject to change without notice, but the park is open from 9 am until 7 pm for the most part. For more details on the summer schedule, check out the Noah’s Ark website. There are no refunds due to inclement weather, so check the weather and pick a good day. No carry-in floatation devices are allowed. However, floatation devices can be rented for the day at the park. If a ride requires a tube or mat to be used, it will be provided at the ride. However, tubes can also be rented for use throughout the day in the wave pools and other noted rides if you want. Also, no coolers are allowed inside the fenced-in area. Children ages 2 and under are always FREE! From I-90, take exit #89 Hwy 23 (Lake Delton/Reedsburg). Turn right at the bottom of the exit ramp onto Hwy 23. At the first stoplight, turn left onto Hwy 12/23. Go one mile through the stoplight at Hwy 12/Lake Ave. intersection. Go about one block, and Noahs Ark Water Park is on the right. Check out the website at Noahs Ark for more information.